In the early 20th century, New Zealand had the world’s most effective system for settling disputes between employers and employees. In the 2000s, there was still a very low rate of strikes and other labour disputes. However, disagreements between New Zealand workers and their bosses have sometimes resulted in violent confrontations and heavy losses to the economy. When workers and their employer cannot resolve a dispute (over wages or work hours, for example), they can ask a mediator to listen to their arguments. If they still can’t agree, the mediator may decide for them. This is called arbitration. lockouts, when an employer prevents staff from working. In 1821 in the Bay of Islands, Māori timber workers stopped work because they wanted to be paid in money or gunpowder, instead of food. In 1840, Wellington carpenter Samuel Parnell refused to work more than eight hours a day. Workers in other areas also demanded an eight-hour working day. Schoolboys went on strike in the 1880s against too much homework. New Zealand’s first big nationwide strike was in 1890, when workers at ports around the country went on strike, initially in support of Australian unionists. From 1894, employers had to bargain with registered unions. If they could not agree, an arbitration court made the decision. Wages and working conditions improved, but some unions were unhappy because they were not allowed to strike. In 1908 miners in Blackball, on the South Island’s West Coast, went on strike for a shorter work day and longer lunch break. After a three-month strike, the mining company agreed. 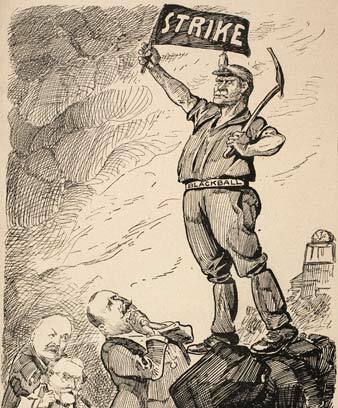 Miners’ and other unions set up the Federation of Labour, which favoured bargaining directly with employers instead of using the arbitration court. In 1912, 1,000 miners in Waihī went on strike. Police arrived, strikers were jailed and hundreds of strike-breakers did the jobs of the striking workers. Violence broke out and one striker was killed. In 1913, about 16,000 port and mine workers went on strike for six weeks. The government brought in strike-breakers, and there was fighting in the streets. The first Labour government in 1935 extended the arbitration system to include more workers. It was compulsory for workers to join the union that covered them. In 1951 the wharfies (waterside port workers) refused to work overtime, in protest over a low pay increase. Their employers locked them out of the workplace, and the government banned union meetings and publications. It was illegal even to give food to strikers’ children. Other unions supported the wharfies, and 22,000 people were out of work for five months. During the 1960s and 1970s strikes were at an all-time high. There were political strikes over issues such as apartheid in South Africa, or the Vietnam War. From 1991 workers no longer had to belong to a union, and could bargain with their bosses directly. From 2000, a new law promoted mediation. There were very few strikes.